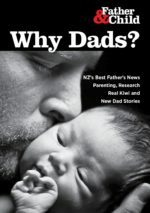 Posts tagged with "At-Home Fathers"
On Tuesday 29th Aug 10am – 12pm, Dave Owens, David Ringrose and Brendon Smith are presenting: Engaging Dads Early, Converting Tricky Fathers into Involved Dads and Engaging Dads around Perinatal Mental Health issues. Dan Brown, a young father being supported by the Father & Child Trust, was interviewed on TV3 about the new “In Your Hands” DVD produced by Great Fathers. Inland Revenue is inviting submissions on a proposal by United Future on how to administer a potential Income Splitting system. Income Splitting means that a couple (only parents under the proposal) is treated as a tax unit rather than two individuals, and each parent is taxed on half of their combined income.